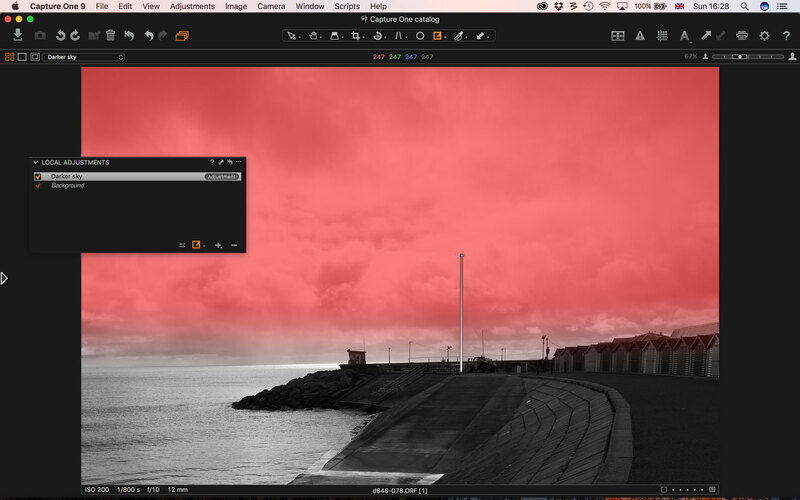 Maybe you wouldn’t normally think of Capture One Pro as an image-editor. 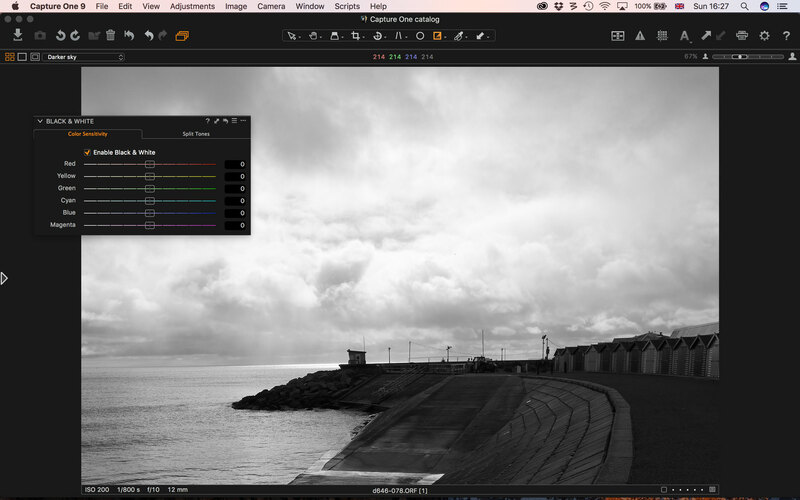 It’s a superb RAW converter and general image enhancement tool, but most of the time you’d probably swap to a plug-in or an external editor for really detailed effects work – especially any that required localised adjustments. 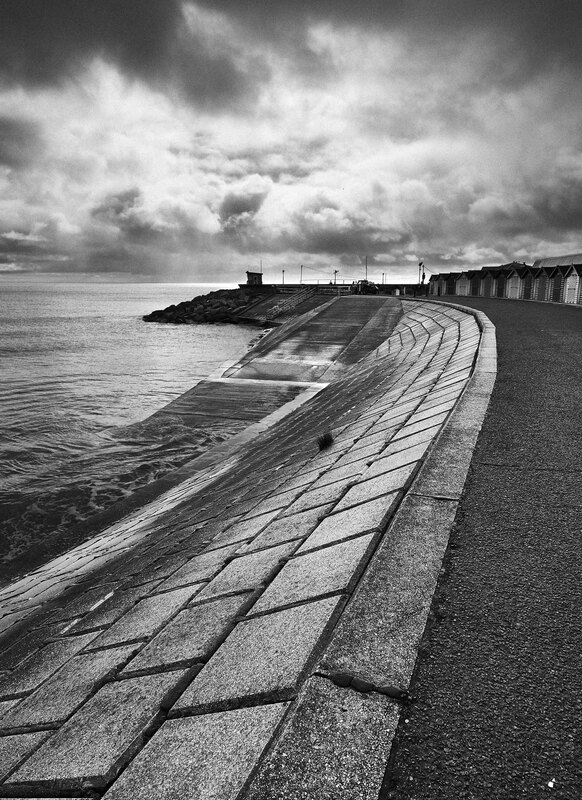 But I’ve been spending some time with Capture One Pro and, being a bit of a black and white nut, I thought I’d try it out one some images I shot in Dawlish, on the UK’s South Devon coast, on a blustery, showery February day. So it’s not much to look at right now, but I thought I had probably captured enough detail in that sky and the foreground to turn it into something interesting in black and white. There’s no rocket science here. 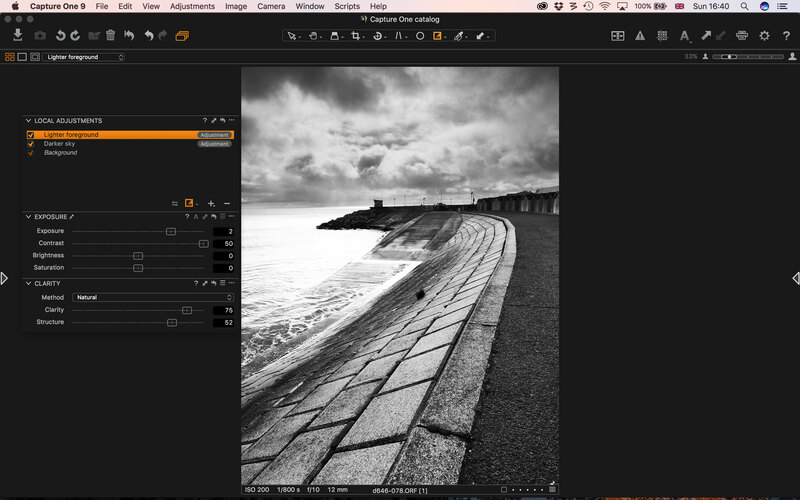 Capture One Pro has a Black & White panel on its Color tab and I’ve just dragged it off the tools panel here so that you can see it more clearly and set the tools panel to auto-hide. I’ve checked the ‘Enable Black & White’ button but I haven’t made any changes to the colour mix because there’s not enough colour information in the original image to offer any useful tonal adjustments. The first job is to darken that sky to reveal more highlight detail. It was shot with an Olympus OM-D E-M1, which is pretty good at holding on to highlights when you shoot RAW. For this we need the Local Adjustments panel, which I’ve dragged off the Local Adjustments tool tab to float over the image. To create a new layer, I click the small ‘+’ symbol near the bottom right corner of the palette. I’m calling the new layer ‘Darker sky’ so I can identify it more easily later. Now I select the Gradient Mask tool from the mask drop-down on the top toolbar. 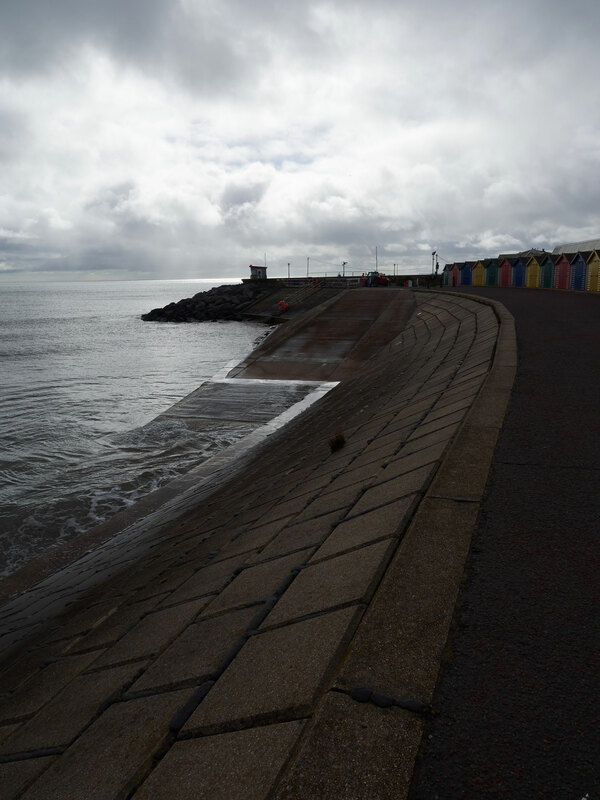 If I drag downwards from a little way above the horizon down to the roofs of the beach huts, I create a mask for the sky and a smooth blend towards the horizon. Now I just need the Exposure panel, where I reduce the Exposure value and increase the Contrast a little. This recovers those silvery highlights in the brightest parts of the clouds and makes the sky a little more dramatic. You’ll have noticed that I’ve now torn off two panels from the sidebar. If you drag one close to the other they snap together neatly. This is handy when you want to concentrate your attention on a single job. To lighten the foreground I need another adjustment layer and, this time, a gradient mask dragged upwards across the horizon line. This time a simple Exposure and Contrast adjustment isn’t enough, and I need the Clarity panel tool, adding a hefty boost to both the Clarity and Structure sliders. But there’s a problem. Even after a few tweaks to both adjustment layers, that foreground lightening adjustment has left the area of sea on the left side of the picture is far too bright. 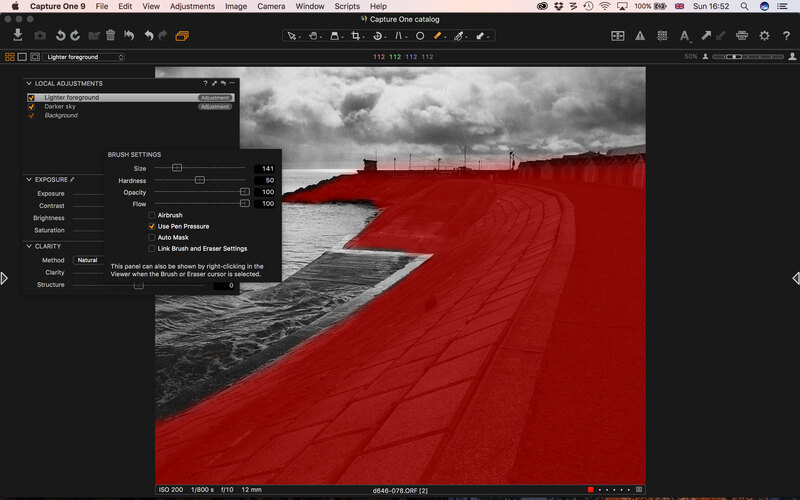 This is where the manual masking tools on the top toolbar’s masking drop-down come in. I can use the Erase tool to brush away the mask over the sea in the ‘Lighter foreground’ adjustment layer so that this area is no longer lightened. It takes a few moments because I need to start off with a large brush for the bulk of the sea area and then a smaller brush so that I can get tight up to the edge of the slipway and sea wall. There’s a button to access the brush settings at the bottom of the Local Adjustments panel. You’ll see this has an Auto Mask checkbox which can help you create accurate masks tight against object edges. I tend not to use it unless I have to, but it wasn’t really necessary here. 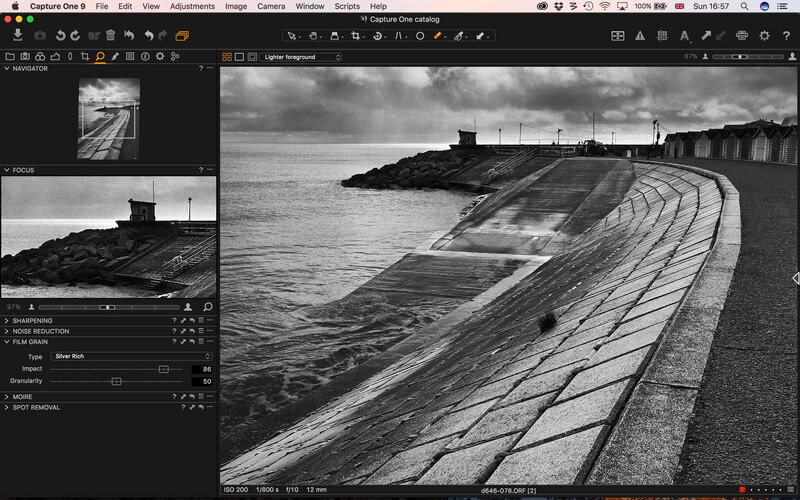 Digital images can look a little clean and clinical close up, and the smart folk who designed Capture One allow for this with a ‘Film Grain’ panel on the Black & White tab. I’ve chosen the ‘Silver Rich’ grain type and chosen a high ‘Impact’ value and a medium ‘Granularity’ value. The ‘Focus’ panel, above, gives me a close-up preview of any area of the image. And here’s the finished picture. I’d normally migrate to Silver Efex Pro for black and white work, or MacPhun Tonality, but doing this in Capture One has reminded me that maybe I don’t need to. All the tools I needed to get the effect I wanted were right here, even down to a beautifully filmic granularity. I’d still need one of the other programs for frames, light leaks, bokeh or other more esoteric image effects, but I didn’t need any of that here and Capture One has done a really good job. Remember too that these adjustments are non-destructive. I’ve exported the image for use in this post, but the original is still in my Capture One catalog complete with the masks and adjustments you see in this tutorial, and I can change or remove them any time I like. Thanks Rod that is a helpful post. 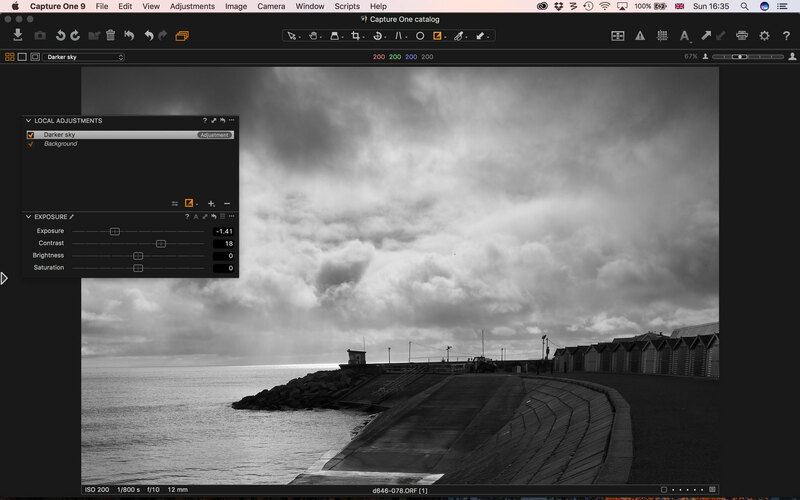 I have been spending increasing time in Capture One and am beginning to realise its power and all-in-one capabilities. 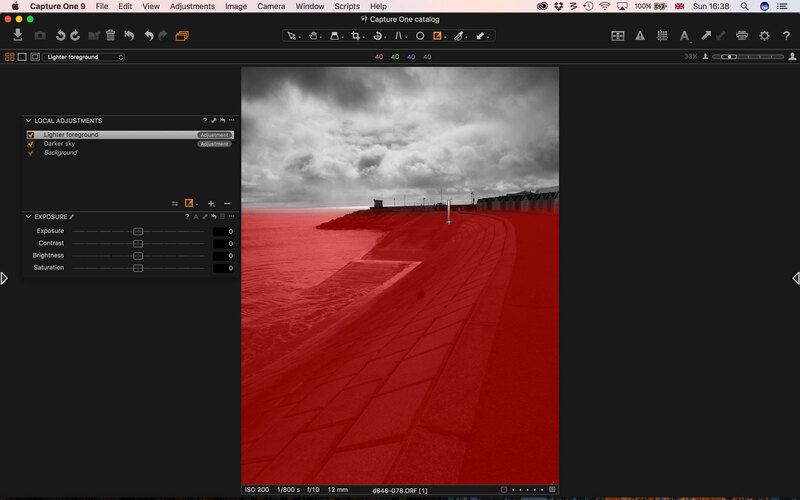 I do like its rendering – in my case for Fuji X files. 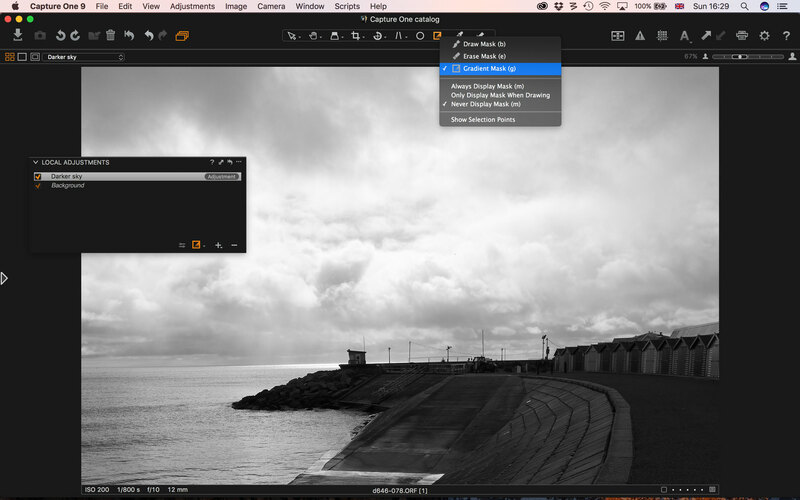 Like many I am a reluctant Lightroom user after Apple’s abandoning of Aperture. While Lightroom is very good I still get tripped up by some of its UI quirks which catch me out more often than those of Capture One. We are lucky to have several choices of Raw converter which are all good enough for most of us in terms of image quality. As when choosing a camera, personal preferences and comfort in use have a big part to play in choice of software.